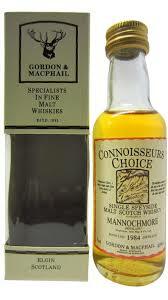 A 1984 vintage Mannochmore from independent bottler Gordon & Macphail as part of the Connoisseurs Choice series. A 5cl Miniature, this was bottled in 2001, judging by the colour, from a sherry cask. Nose: Sweet with oranges. Hints of chocolate and coffee develop and the nose soon evolves towards red fruit to end in a soft, sweet nose. Palate: Hints of spice are present throughout with loads of wood and surprisingly smoky. Chocolate returns giving this palate a rich edge.